Operating conditions in global manufacturing industry improved for the fifth successive month in November, although there was an evident slowdown in the overall rate of expansion, with differences between countries accentuating and not diminishing. 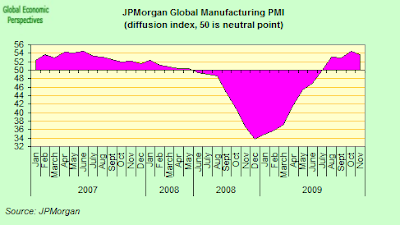 The JPMorgan Global Manufacturing PMI aggregate reading came in at 53.6, down from October's 39-month high of 54.4, and signalling that the first wave of post crisis momentum may be losing force as governments slowly start to remove stimulus measures. Also notable in this month's survey was the unevenness of the expansion which was registered, with some emerging economies - like China and Brazil - continuing to experience a solid expansion, others - like India, Turkey and Russia, showed some slowing in activity. South Africa returned to expansion for the first time in many moths. Among mature economies Japan showed a notable relaxation in the pace of expansion, with a significant drop in new export orders, and a fall in the backlog of work, while in Europe the "usual suspects" of uncompetitive contracting economies - Greece, Ireland, Spain and Hungary in particular - are still to really to show clear signs of recovery. 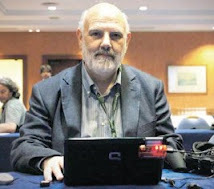 Spain once more trailed the rest of the world, at least in terms of those countries included in the survey. Commenting on the survey, David Hensley, Director of Global Economics Coordination at JPMorgan, said: "The headline PMI fell back slightly in November, but the global new orders and production indexes remained at very elevated levels. National PMIs point to broadly-based manufacturing growth. With final sales rising and inventories falling, the stage is set for continued, strong output growth. Encouragingly, the PMI indicates that the pace of job-shedding is easing although employment growth has yet to resume despite robust output gains." 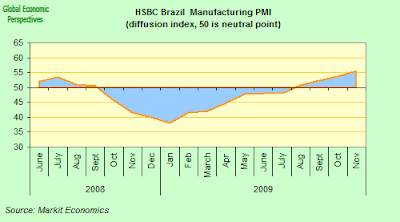 The Brazil PMI rose to its highest level for two years driven by faster expansions in output, new order and employment The headline PMI at 55.5, from 53.7 in October, suggested a marked expansion in Brazil’s manufacturing economy. Furthermore, the latest reading was above the pre September 2008 series. Underlying demand for Brazilian manufactures increased during November, as indicated by a sharp rise in total new business, with growth primarily coming from the domestic market, as new export orders were largely unchanged on the month. Companies generally linked improved domestic demand with better economic conditions inside Brazil itself, while survey respondents suggested that foreign demand weakened due to the strong real and difficult business conditions in key export markets. China's November PMI pointed to another strong improvement in manufacturing operating conditions in the country. 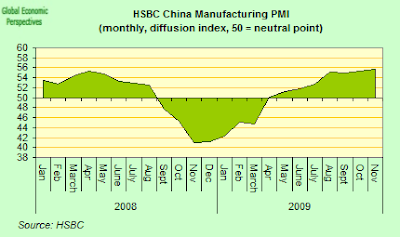 The headline HSBC China Manufacturing PMI rose to 55.7 in November, from 55.4 in October, pointing to a continuation in the most marked period of improvement in operating conditions since the start of data collection in April 2004, with Chinese manufacturers reporting that output growth was maintained for the eighth month running in November. Data suggested that export sales rose again in November, increasing at the fastest rate since March 2005. Those firms that reported an increase in new export business widely attributed this to stronger external demand. November data signalled that staffing levels in the Chinese manufacturing sector increased at the second-fastest rate in the survey history, extending the current period of growth to six months. Activity in Eastern Europe was very uneven, with Polish industry putting in its best performance in recent months, and Czech industry just sneaking over the dividing line between growth and contraction, while Russian industry continued to fall back for a second month, and Hungary remained well behind the rest of the group. Survey data for the Polish manufacturing sector showed that business conditions generally improved in November, bringing to an end a downturn that had lasted a year-and-a-half. The headline HSBC Poland Manufacturing PMI posted a record month-on-month gain in November, rising from 48.8 to 52.4. 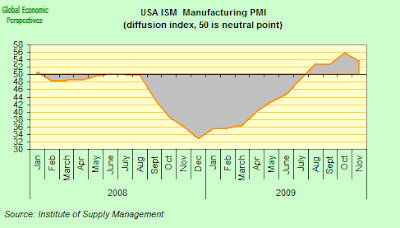 This reading was the fourth consecutive monthly improvement and was the highest activity level since March 2008. Survey responses suggested that the improvement was evenly distributed across both the domestic and export markets. Falling employment remained a drag on the overall recovery, although the rate of job loss slowed sharply during the month, to the weakest seen in the current nineteen-month sequence. 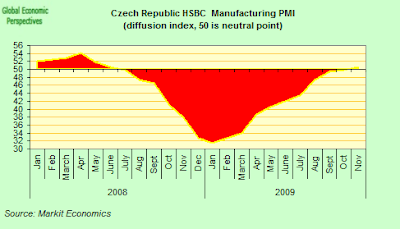 November saw the first overall improvement in operating conditions at Czech manufacturers since June 2008, with the headline HSBC Czech Republic Manufacturing PMI rising for the tenth consecutive month to hit 50.6 (from 49.8 in October), thus registering expanison for the first time in almost a year-and-a-half. Output and new order growth both gained traction, while employment fell at the slowest rate since September 2008. This was the fourth consecutive month in which manufacturing production rose and although it remained well below the long-run survey average, the rate of expansion marked an acceleration on October. Underpinning rising workloads was a fourth straight monthly increase in new orders. Incoming new business increased in both domestic and export markets, with demand slightly stronger in the former. 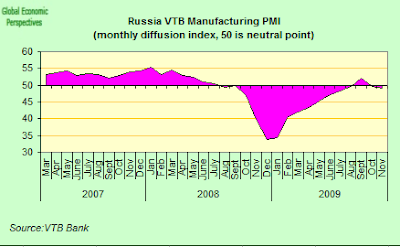 In Russia in contrast November saw an overall deterioration in business conditions for the second month running. Output rose only marginally, while incoming new orders fell for the first time since June. Growth of purchasing activity was maintained, but at a slow pace, while employment continued to fall. The headline seasonally adjusted Russian Manufacturing PMI remained below the no-change mark of 50.0, although the November figure of 49.1 indicated only a marginal rate of deterioration, even if it was a slightly worse one than the 49.6 posted in October. 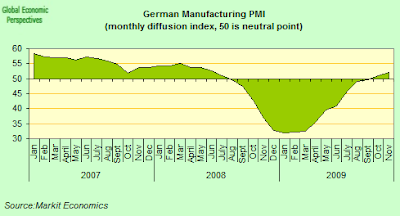 The fall in the PMI primarily reflected slower output growth and falling new orders. 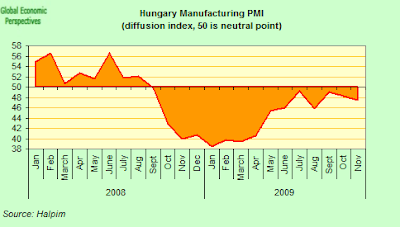 Hungary remains the outlier among those East European countries who have PMI surveys, and the manufacturing PMI dropped 0.8 percentage points to hit 47.5 points in November, according to the Hungarian Association of Logistics, Purchasing and Inventory Management. It is now clear that the steady improvement that started in the spring has now ground to a complete halt, and even moved into reverse gear as conditions in the Hungarian economy continue to remain extremely poor. Before the present crisis the Hungarian index had been above the 50 level for more than three years until it slumped to 42.6 last October, going on to hit its all-time low of 38.5 in January. This is thus the longest stretch of contraction in activity since the survey was first launched, and there appears to be no immininent end to Hungary's industrial agony in sight at this point. The final Markit Eurozone Manufacturing PMI rose to a 20-month high of 51.2 in November, up slightly from 50.7 in October and above the flash estimate of 51.0. 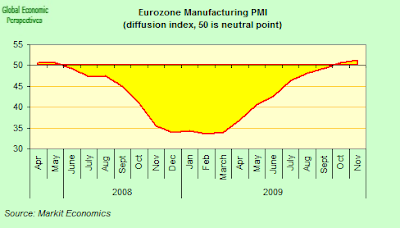 The headline PMI has now remained above the neutral 50.0 mark for two successive months. Growth of output and new work received was the fastest for 26 and 27 months respectively and, for both variables, stronger than earlier flash estimates. Manufacturing production increased for the fourth consecutive month in November, led by the strong performances of the intermediate and investment goods producing sectors. Higher output was also signalled among consumer goods producers, but the rate of expansion remained weak. Disparities between the performances of the various member states continued in November, with growth in the headline index again being predominantly driven by Germany and France. The rate of expansion of output eased back slightly in France, but remained amongst the strongest gains seen since mid-2006, while in Germany growth hit a 26-month high. An increase in the output component was recorded for the Netherlands (25-month high), Italy (26-month peak), Austria and Ireland (the first production gain since February 2008). The contraction continued in both Spain and Greece, with rates of decline accelerating over those seen in October. German manufacturers indicated robust rises in output and new orders in November, with rates of expansion in both cases accelerating to the fastest since the third quarter of 2007. Growth was supported by improved global economic conditions, which led to a resurgence of new export orders alongside higher spending among domestic clients. Meanwhile, with backlogs increasing for the second month running and the ratio of new orders to inventories at a comparatively high level, a number of forward-looking survey indicators now suggest that firms may well continue raising output from the depressed levels seen earlier in the year. At 52.4 in November, up from 51.0 in October, the headline seasonally adjusted Markit/BME Purchasing Managers’ Index suggested there had been a solid improvement in business conditions over the month, although substantial job shedding persisted. Lower employment numbers have been recorded continuously since October 2008, with the latest fall linked to low levels of capacity utilisation following the slump in demand earlier in the year. In France the manufacturing sector also registered another strong expansion in November, with both production and new orders continuing to rise strongly. On the other hand, there were signs of some underlying weakness since employment and output prices both fell further. 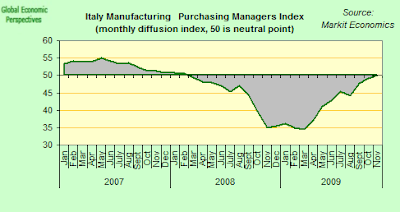 The headline Purchasing Managers’ Index posted 54.4, down slightly from 55.6 in the previous month, but still the second-highest reading in the past three years. French manufacturers continued to reduce their staffing levels during the survey period, with many firms citing restructuring plans, but the pace of job shedding remained weaker than the steep rates seen in the early part of 2009. November saw the first overall improvement in operating conditions in Italian manufacturing industry since February 2008. Both output and new business rose at their fastest rates over two years, while new orders from abroad increased for the first time since January 2008. This being said, as Markit point out the data show only a fractional improvement and continued to highlight underlying weaknesses in the Italian economy in general. In particular workloads were too low to maintain current workforce numbers, and pricing power remained subdued. The seasonally adjusted Markit/ADACI Purchasing Managers’ Index came in at 50.1, up from 49.2 in October, but only fractionally above the 50.0 no-change mark that separates improving from deteriorating conditions. Despite higher demand and production volumes, firms continued to cut staffing numbers, and manufacturers reported that lower workloads continued to reveal spare capacity at their plants. As a consequence staffing numbers were reduced for the twenty-second straight month, and at a marked pace. 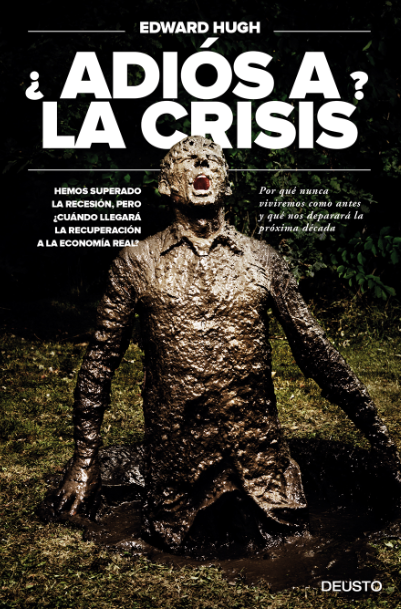 Spanish manufacturing is evidently the worst of the bunch for yet another month, and November data pointed to a further deterioration in operating conditions across the manufacturing sector. Worse, the rates of decline of key variables such as output, new orders and employment all accelerated during the month. 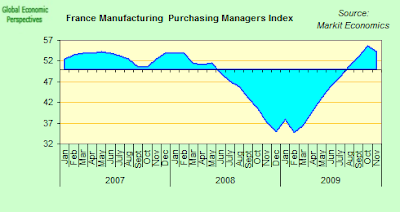 In fact the seasonally adjusted Markit Purchasing Managers’ Index fell to 45.3 in November, from 46.3 in October. The PMI has now stood below the neutral 50.0 mark for two years, with the latest reading showing the strongest contraction since last June. Panellists indicated that lower demand, particularly from domestic sources, led to the latest drop in new business, which was the fastest since May. New export orders also contracted during the month. With new orders continuing to decrease, Spanish manufacturers utilised spare capacity through the completion of backlogs of work. Excess capacity led firms to restructure their workforces accordingly, resulting in another sharp decline in employment. Moreover, the rate of job cuts was the fastest since June. 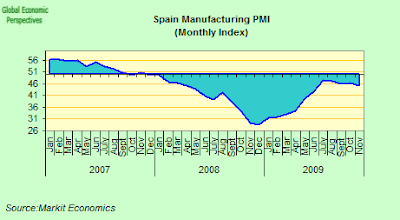 And Spanish manufacturers continue to cut back on their holding of stocks, indeed the pace of reduction remained substantial despite easing from the month before. Stocks of finished goods also fell sharply in November, extending the current period of decline to thirteen months, as firms depleted stocks in line with lower new orders and production volumes. Greece also retained its status as another of the Eurozone's weak spots, with business conditions continuing to be difficult for Greek manufacturers, while demand for their goods fell at an accelerated rate. 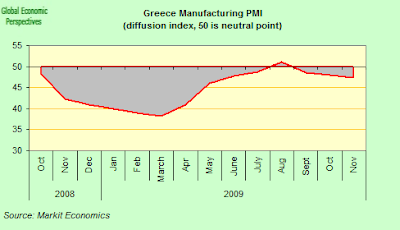 The seasonally adjusted Markit Greece Manufacturing PMI slipped further, hitting a six month low of 47.3. If we exclude the brief respite registered in August, the headline index has now remained below the no-change threshold since October 2008. Overall, new business fell at a strong pace, and dat showed that foreign demand was particularly weak, with incoming new work from abroad decreasing markedly since October. Backlogs were reduuced, and both unfinished work and employment continued to fall, the former at an accelerated pace. Respondents linked further workforce rationalisation to lower production requirements and cost pressures. Employment has now contracted during every month since May 2008. November data indicate the first joint increase in both production and new business registered by Irish manufacturing in twenty-one months. Employment continued to fall, but at the slowest rate for a year-and-a-half. As a result the seasonally adjusted NCB Purchasing Managers’ Index rose slightly to 48.8, from 48.0 in October. This result still means that overall operating conditions in the Irish manufacturing sector continued to deteriorate during the months, extending a run that has now lasted for two years. Higher output during the month largely reflected new order growth, which in turn was attributed to strengthening demand. New export orders increased for the second time in three months, and at a faster pace than overall new business. Despite the expansion in new business, Irish manufacturers continued to reduce the backlog of outstanding work as the spare capacity resulting from the severe economic downturn remains only too evident. 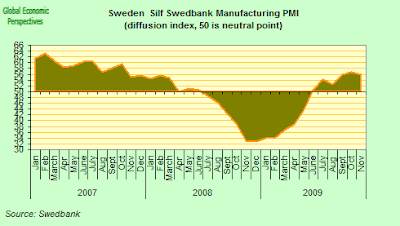 Sweden's seasonally adjusted purchasing managers' index dipped back to 56.0 in November from 56.7 p in October, according to data compilers Silf and Swedbank. However November was the sixth straight month that the index has been over 50 following the sustained rebound from a low of 32.7 hit in December last year. One of the problems in November was that the sub-index for order eased back to 57.9 from 60.8 in October, suggesting that while new orders continued to increase they did so at a slower rate. The sub-index for order backlogs also fell back, by an even greater amount, retreating to 53.6 points from 58.9 points, but it should be remembered that both the order bookings index and the backlog index had readings over 50 and thus showed continued growth. The employment sub-index, on the other hand rose, climbing 4.9 points to reach 48.7, suggesting that although companies continued to scale back on staff they did so at a slower rate. This easing in the Swedish PMI expansion rate is hard to interpret at this point, although it could be connected with the recent rise in the krona (since September). It could also be a result of the earlier strong bounceback from very low levels losing some of its force. 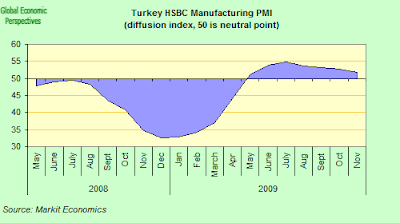 The Turkish headline PMI posted 51.8 in November, indicating that business conditions in the Turkish manufacturing sector improved for the seventh consecutive month. They did so however at a rate which eased again since October and indeed one which hit a six-month low. New order growth although still solid, slowed from October, with the rate of increase being the lowest registered during the current seven-month expansion. The rate of growth of new export orders also eased during November, although it was higher than the average recorded for the earlier seven-month period of increasing export business. The overall rise in new orders led to a further rise in output during November, although the rate of increase fell for the fifth successive month from the series high posted in June 2009. Backlogs of work fell markedly in November, indicating that capacity constraints remained largely non-existent. In addition, anecdotal evidence suggested that companies were utilising stocks of finished goods to partially fulfil order obligations, and stocks of finished goods fell for a fourteenth successive month. The Kagiso South Africa Purchasing Managers Index rose back above the neutral 50-index point level in November, even if the rebound in South Africa’s manufacturing sector is expected to be muted compared with historical experience, especially given the strength of the rand. The November PMI poked its nose over the 50 neutral mark and hit to 50,3 points, the first time this has happened since May 2008. 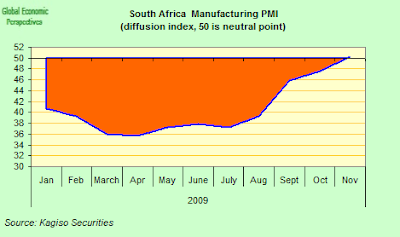 This was the fourth consecutive gain for the PMI and bringing to a close the run of 18 months of below 50-index point readings, by far been the longest (and most severe) decline in the South African factory sector since the survey started in 1999. 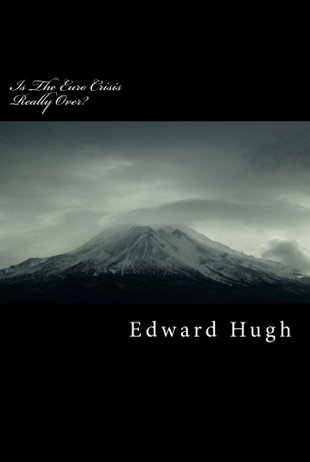 The previous record contraction had been the six months between May 2003 and October 2003. Nevertheless, PMI readings from the first two months of the fourth quarter suggest that the third-quarter manufacturing sector rebound has most probably been sustained during the fourth quarter. The average PMI for October and November stood at 49 points, compared with the average 41 points recorded for the third quarter. The annual decline in South Africa’s manufacturing output has slowed, contracting by 11,4% year-on-year in September, compared with 15,2% in August. This was an improvement on the 17,1% year-on-year contraction in output recorded in June, the 17,2% year-on-year decline recorded in May and the record 21,6% slump in manufacturing output in April. At the same time it should be noted that the expected business conditions subindex fell for a second consecutive month to 65, down 5.3 index points since the start of October. Kagiso and the Bureau of Economic Research (BER), which conducted the PMI survey, suggest that this could indicate that purchasing managers were becoming less optimistic about future prospects. On the other hand the new sales orders index recorded a 5.5 point increase to 54.4 in November, the highest level since April 2008, suggesting that demand for manufactured goods has returned in South Africa, at least for the time being. Job shedding continued, albeit at a slower pace, with the employment index improving to 46.6, compared with 45 in October. “Although the level of the index suggests continued factory job cuts, it does indicate that the rate of retrenchment is moderating. This is welcome news from an economywide employment perspective as official statistics showed that the manufacturing sector was the hardest hit by job losses during the third quarter of the year,” According to the comment from André Coetzee for the survey organisers. 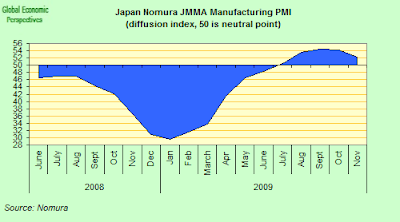 Despite remaining above the neutral level of 50.0 for yet another month , the seasonally adjusted headline Nomura/JMMA Purchasing Managers’ Index fell in November to a four-month low of 52.3, signalling that growth in the Japanese manufacturing sector continues to lose momentum. In particular the survey organisers noted slower growth of output and new business, even if job shedding eased to its weakest rate for fifteen months, even as output price deflation the hit the fastest rate since December 2001. November’s survey pointed to weaker rises in output and incoming new business, while pre-production inventories were reduced for the ninth month running. Suppliers’ delivery times lengthened at an accelerated rate, while the pace at which job cuts were implemented continued to ease. Those survey participants that reported greater inflows of new work generally attributed this to firmer demand, with China mentioned in particular. However, growth was partly offset by subdued market conditions as customers remained wary about the immediate outlook for economic activity. The US manufacturing sector expanded for a fourth month running in November but at a slower pace than expected. The Institute for Supply Management said its manufacturing index fell to 53.6 percent from 55.7 percent in October. The slowdown was sharper than the average analyst forecast of a 55.0 percent reading. Regarding the sub-indexes, the ISM said its index of new orders was 60.3 percent, 1.8 percentage points above October's level, suggesting accelerating growth. The production index however fell 2.3 points to 50.8 percent, indicating output expanded more slowly. Employment also grew more slowly, with the index at 50.8 percent from 53.1 percent a month earlier. So What's It All About, Costas? Global Growth Forecasts - Seeing is Believing?